efsli Trainers provide an excellent opportunity for trainers from across Europe to meet and share ideas. Please find the efsli report on sign language interpreter training programmes in Europe here. Please find the efsli report on new skills and professional profiles required for the sign language interpreter profession here. 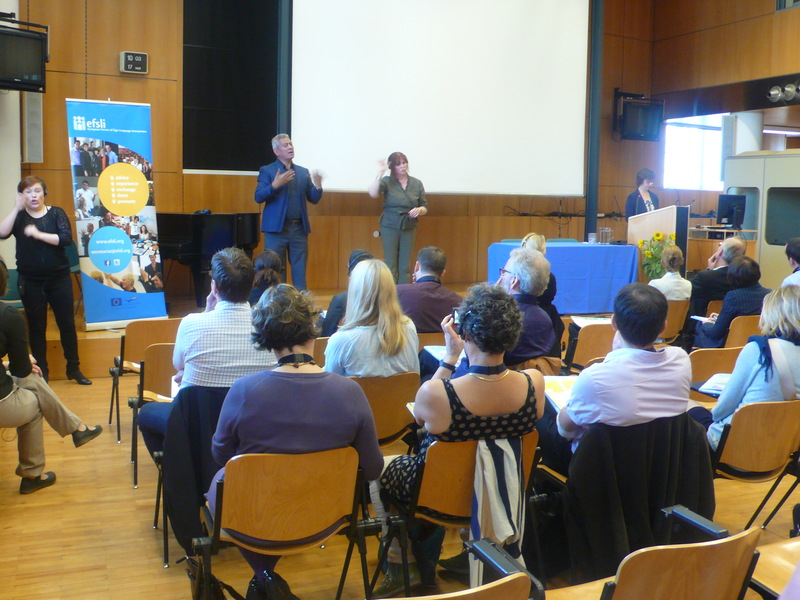 efsli Trainers’ Seminar 2012 was hosted by the Department of Translation Studies at the University of Graz from 17-19 September 2012: Sign Language Interpreter Training: An Integrated Approach. The efsli Trainers’ Seminar aimed at establishing an exchange of information for all professionals involved in sign language interpreter training, and initiating a discussion process on new and innovative approaches to the training of sign language interpreters. As the Department of Translation Studies at the University of Graz is a training institution for both spoken and signed language interpreters offering courses for community, conference, liaison, and court interpreting, the Seminar focused on the question of mutual benefits in curriculum planning and teaching methodology: an integrated approach. See for more from efsli Trainers’ Seminar 2012 website.